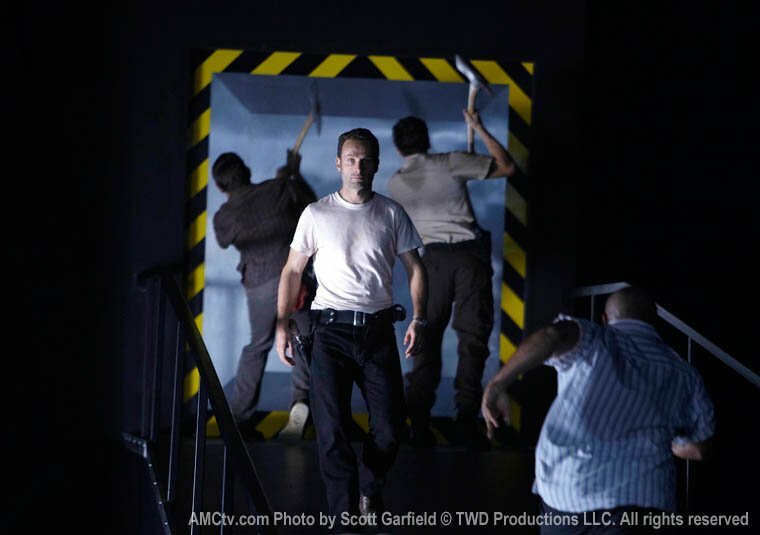 Is there a glimmer of hope for our remaining band of survivors after last week’s cliffhanger? 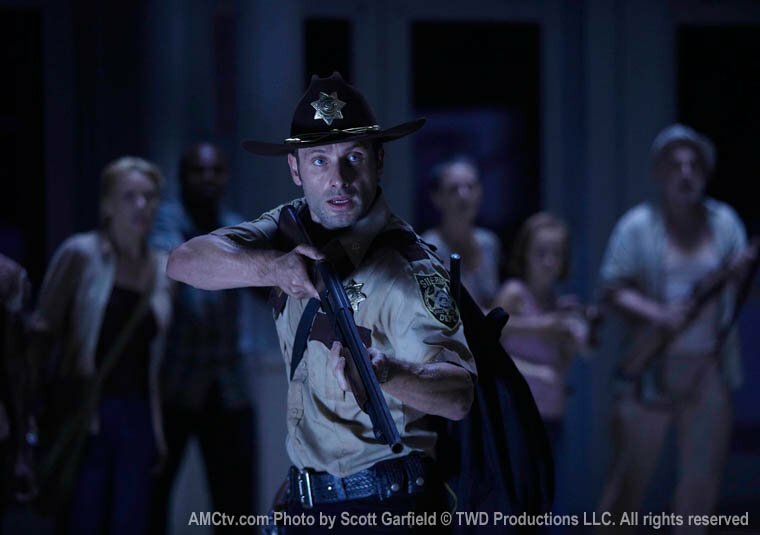 Andrew Lincoln’s Rick Grimes led the group of survivors to a desolate Army base camp where we assume they could find safety only to be reluctantly let in by experiment scientist nicely obviously named Dr Edwin Jenner, who has been doing several ambiguous tests on brains of the dead. It’s unbelievable to think that this is the final episode of this season of The Walking Dead and it has positively flown by, and this season finale holds holds larger expectations than other episodes. It ends on a quieter/bang note and perfectly leaves enough open for Season 2, but as you would expect for a horror series it ends on a cliffhanger. In the bunker of the army base the survivors manage to find some form happiness and joy, believing that they are finally safe in some form. Over several bottles of wine the group laugh and manage to unwind until killjoy Shane spoils the mood. 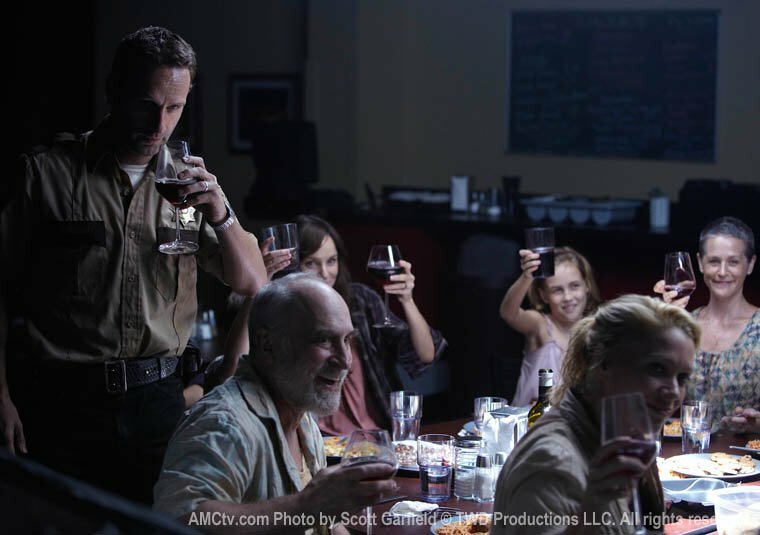 The romantic triangle between Shane, Rick and Lori still remains. This comes through particularly with Lori feeling resentful towards Shane for telling her that her husband was dead and Shane expressing his feelings towards Lori. To a point almost where Lori is nearly assaulted. A moment beautifully played by Jon Bernthal and Sarah Wayne Callies. The best aspect of this whole season has always been the drama between the characters, that is what is important in making the show as gripping and as emotionally involving as it is. This element also becomes very apparent when they are trapped in an environment like the underground base, where it becomes more claustrophobic and the plot is allowed to play out with that tension underlying it. Very smartly in this episode we get a brief insight into the work of Dr. Edwin Jenner (who we met briefly at the end of the last episode) and what he is doing all alone in the underground base. We learn that his team of researchers were looking at how the body reacts to infection and what happens once we turn into the walking dead. Of course the allegory between Jenner the character and Jenner the actual scientist is not one of subtlety, the real life Edward Jenner was the man who invented the vaccination and had a fascination with curing disease. Essentially what this Jenner is doing is similar thing, trying to find a chemical explanation behind the outbreak, whether it is chemical or biological, but he can provide nothing. Ambiguity to the outbreak is what is nice about this show, like Romero’s Dead films it never felt the need to explain why the dead were rising en masse. The fact that the explanation for their being zombies in the Walking Dead is that there is no explanation is a brilliant piece of tongue in cheek and clever writing. Despite the station being very secure, it begins to run out of power and in a very awkward author’s message moment, Jenner announces: “the whole world runs on fossil fuels how crazy is that?” of course that hope would never last long as the nonrenewable resources deplete. It is the one bad note among a very fine script, it just strikes as being too obvious, it comes out of the blue too considering the issue of fossil fuels and alternative energy hasn’t come up before now. Jenner cracks and as the base counts down to ‘decontamination’ or a very huge explosion, the doctor decides to stay behind as the others flee. What everyone now recognises is that there is nothing left for them but a futile existence to survive in a world with now no hope. The end is bleak and leaves our survivors in a crisis of what on earth they are going to do now. All in all, this is a masterpiece of a TV show. No show in recent memory, other than Breaking Bad and Mad Men, has astounded me in the same way has done. What those have in common of course is the production company AMC. Who are now overtaking HBO as producing the most artistically rewarding TV in the business, they create shows which are underpinned by characters and by story. The Walking Dead is the best new show this year and is only behind Mad Men as the best TV of the year. Truly mesmerising, unique and daring.